Goodbye, gold shirt. Hello, black shirt. A few of Nebraska’s starters on defense are officially Blackshirts now. Seven Huskers earned the honor after a strong performance against Colorado despite the loss: linebackers Luke Gifford, Mohamed Barry, Tyrin Ferguson and Dedrick Young II, cornerback Dicaprio Bootle and defensive linemen Mick Stoltenberg and Freedom Akinmoladun. "I was not in a yellow jersey today," senior outside linebacker and captain Luke Gifford said Monday. "There's a few other guys as well, which is fun. As a defense the goal is to win the game and that's what needs to be done, but we did a lot of good things. We played like Blackshirts." "There's a lot of other guys that didn't get one today that will get one soon given the way they played." 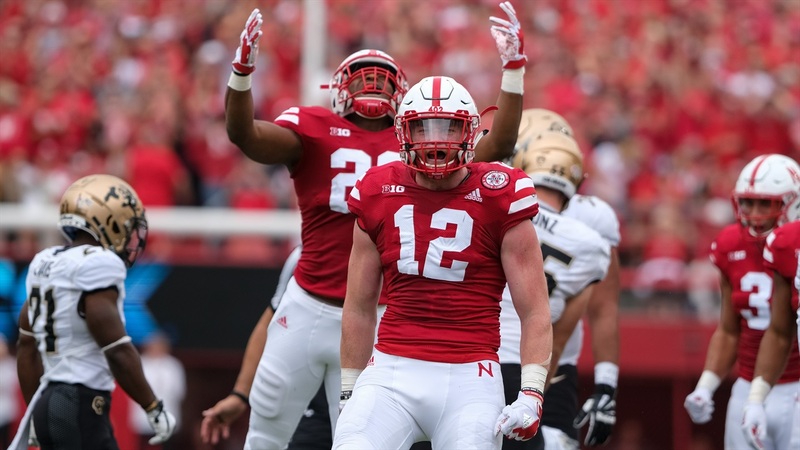 Gifford said head coach Scott Frost let the team know that a few of them would be receiving Blackshirts. The recipients showed up to Monday's practice to find the coveted black practice jerseys hanging in their locker. "It was a great feeling," Barry said. "It means a lot to get one from the staff. It means a lot to get one from my position coach, Coach [Barrett] Ruud. "It means a lot to us because it means a lot to him." Nebraska’s defense held Colorado to 44 rushing yards thanks in large part to an attacking scheme that resulted in 12 tackles for loss, including seven sacks. The Huskers had just 14 sacks over 12 games in 2017. Nebraska’s performance against the run had the Huskers ranked second nationally in rushing yards per play allowed (1.26) after Week 2. The Huskers also lead the country in sacks per game. Gifford praised the new style of play on Saturday. He ranked second on the team in tackles behind Barry and was one of three Husker linebackers, alongside Ferguson and Young, to record two tackles for loss. The Huskers defense still has plenty of room for growth, too. Colorado’s 351 yards passing left Nebraska ranked 125th in passing yards allowed per game and 100th in pass efficiency defense. Defensive coordinator Erik Chinander will also likely hope for some takeaways in the games to come. Nebraska didn’t have any in the opener. Chinander’s 2017 Central Florida defense ranked second nationally in takeaways (32 over 13 games). But Saturday's result, despite the loss, was an encouraging sign for a defense that ranked 112th nationally in yards per play allowed. Just ask the guys who see it most –– the offense. "In my whole entire time here, I've never seen our defense play like that," senior running back Devine Ozigbo said. "That was really cool to watch. All those boys, they've been working really hard, so it's definitely cool to see them earn those Blackshirts. "A couple of guys got them, and it's just going to make everyone else even hungrier to go get them."